I've just returned from my annual visit to Mount Angel Abbey in Oregon. 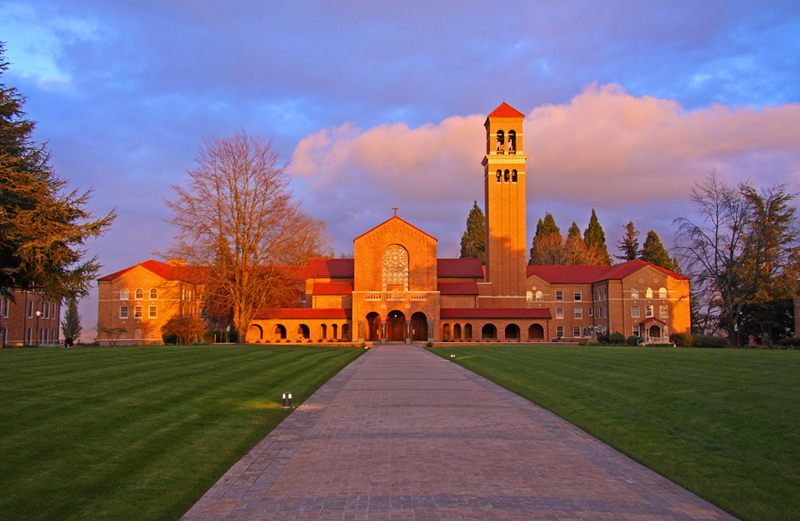 There are many attractions to this beautiful place, including the Abbey itself, the Alvar Aälto-designed library, and the beautiful surroundings of the Willamette Valley. This year, an additional joy was seeing a dear friend and gracious mentor presiding with miter and crosier at Mass on the Assumption – Jeremy Driscoll was just elected the 12th Abbot of Mount Angel in March. We were fortunate to be there for both the solemnity and the preceding Sunday. The homilies at both Masses were sublime, and I was fortunate enough to get a copy of Sunday's, given by Father Pius X Harding, who is both the guestmaster and the Abbey's director of Oblates (of which I am one). Father Pius's homily is offered below, with his kind permission. It addresses superbly very difficult questions many of us have about the Gospel text (Luke 12:49–53), while giving excellent advice about the right way to witness in charity to the truth. “Do you think that I have come to establish peace on the earth? No, I tell you, but rather division.” These are very perplexing words from our Blessed Lord. What does he mean? A puzzling contradiction: Jesus is the Prince of Peace! He is our only hope for peace. Why does the Lord speak this way? Today’s Gospel is rich and varied in its meaning. The Sacred Scriptures urge us to stop thinking in conformity with the world – to challenge our perceptions about what we see and what we are told today in our media driven world. The peace our Lord brings is one the world cannot easily grasp. Not unlike the disciples themselves, who expected the Messiah to be a worldly king, we too may harbor the desires for a temporal, a practical peace – a world and way of life absent of earthly want or war. But, what does this have to do with everlasting life? The collect of today's liturgy prays for the “good things which no eye can see,ˮ things that “fill our hearts with loveˮ which attain that divine promise that surpasses “every human desire.ˮ What is this good of which the collect speaks? What is our ultimate desire? The peace of Jesus Christ is no mere absence of conflict or want. It is self evident that in today’s world, the Word of God “divides three against two, and two against three.ˮ But, one might say: God is true. He is goodness itself, and He is all-beautiful. How can this divide? The Gospel challenge to us is to root out from our hearts all that is opposed to the Word of God, and to reject all that is contrary to truth, goodness and beauty. We believers cannot settle for an apparent worldly peace, which often is nothing more than an attitude of complacency with mere existence. Our calling is higher – as high as Heaven itself. The peace we receive from our Saviour is one that was purchased for us, and at a great price. No one is saved unto eternal life except through the Sacrifice of Jesus Christ, the only begotten Son of the Father, Who was conceived by the Holy Spirit and born of the Blessed Virgin Mary for just this purpose of restoring us to union with our Father, the Maker of all things. This is the truth that causes such division in the world: that Jesus is its unique Saviour – there is no other. We live in a society and in an age when many would just rather pretend that all are in agreement. I’m ok, you’re ok – can’t we just get a long. Well, maybe we can just get along, but is that all to which we are called by the Holy Gospel? No, we are called to a “glorious exchange,ˮ we hear in today’s liturgy. We are destined in the heart of God to communion – a peace with one another made possible by our union with the God who made us and loves us – loves us enough to redeem us and call us by grace to real life – eternal life – true life in Christ Jesus, the only Prince of Peace. There can be no peace where there is no love, and there is no love, were truth does not matter. Does this mean that we all have to go out on a campaign to stamp out everything contrary to Christ’s truth? Perhaps we do have a campaign before us, but it is a campaign fought not with physical battles or rude argumentation, rather, it is one fought with personal mortification and courageous witness to the God who is Love, giving eloquent testimony through lives of charity, that God gave His life for us. This is a truth worth fighting for. We are asked today to discern just what kind of zeal resides in our hearts. Our Blessed Lord came to set a fire on the earth – a fire of charity, fanned by the Holy Spirit, a fire He wills should burn within our hearts – a charity that compels us to act. Jesus expresses this desire in the Holy Gospel when He says: “I have come to set the earth on fire, and how I wish it were already blazing.” If the fire of God’s love is not already blazing in our hearts, today is the day to ignite it, and the Holy Eucharist is the Sacrament of just such a fire. Love for God’s truth, justice and righteousness burns in the Christian heart, and enables us to reject the world’s way of acting, with its tolerance of falsehood, offences against life and family, and its denial of the necessity of the individual’s personal gift of self to the Creator of all things, visible and invisible. The Gospel we are to proclaim is the Gospel of truth and life, but its most effective proclamation is in the practice of charity. Lives exemplifying justice and love offer to our world a glimpse of the real peace of which Our Blessed Lord speaks. The communion antiphon, taken from the Gospel of Saint John, proclaims that central truth which we believers hold so dear: “I am the living bread come down from heaven, says the Lord. Whoever eats this bread will live forever.ˮ The bread He offers is His true flesh and the wine He offers is His Blood given up for us, and unless we eat His flesh and drink His Blood we shall not have life within us. This is the truth we encounter here today. Most of the world rejects the truth of God giving Himself to man sacramentally. Even in our Lord’s time, many of His disciples up and left His company because of this teaching. “These are hard words, who can accept them?” Will we accept them? Will we live by them? Will we confess this truth to an unbelieving world – yet to a world so very much loved by the God it so often rather flippantly rejects. The truth of Jesus Christ is worth fighting for – worth putting ourselves in the awkward position of being socially and politically unacceptable according to the world’s accounting of things. A fire burns within a Christian’s heart, an ardent love, which compels us to defend the rights of God in our world. Division is not bad when it is the line between truth and falsity, or when it is the refusal to cooperate in the world’s rebellion against its Creator and Redeemer, or the Spirit of Wisdom, which they send to guide us. Our Blessed Lord predicted that there would be troubles, even division within families over the gravest of issues, because these are the issues of salvation and eternal life. Some things, as personal opinions, subjective likes and dislikes, are often not worth fighting for, and it can be a vice to do so, but others things – the things of God – deserve our utmost attention and devotion. Truth is truth in any age. The truth of Jesus Christ is objective and eternal. We, of course, cannot not force people to believe, nor can we force them to love. Faith, hope and charity are by the gracious invitation of God. The love of Christ, which is given to us most excellently here in the Holy Eucharist, is the source of the wisdom and courage required to live valiant Christian lives in the midst of a world, which can be, in turn violent and indifferent. 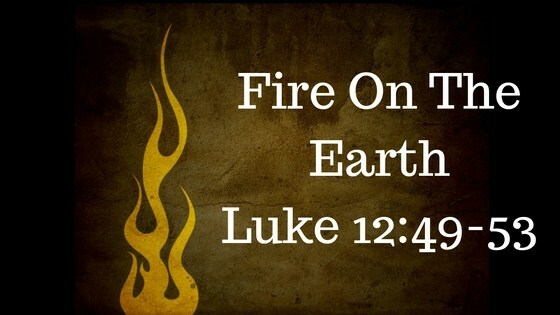 Both are challenges to the Christian, but we can make Our Lord’s desire come to be, His desire that the fire of His love should sweep the earth, if only we will allow that fire to begin here, to flare up within our hearts today.